If you are looking for a LED circuit design, perhaps you happen to have a key chain or pen light with a single super bright light emitting diode operated by coin cell batteries or two alkaline batteries. Chances are that the components used are basically consist of an LED, a diode and a switch. With the advancement of solid state display technology, super bright LED is now available and has been used in many applications. LED is increasingly being used to replace incandescent light at it is more environmental friendly as the power consumed is many times lesser than its counterpart. You will see the applications of LEDs in cars, display boards, traffic lights and many other applications. Green technology is taking a dominant role in helping to reduce our dependent on fossil energy. This simple project will help you understand the effect of internal resistance of component such as an LED in a typical circuit. 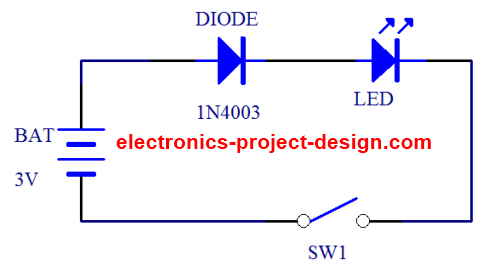 The schematic shows a 1N4003 diode connected in series with a LED and a switch powered by a DC 3.0V battery. The 3V battery can be derived from a regulated power supply or two 1.5V alkaline battery. The LED must be a superbright type that is subjected to current a few times of a typical LED that consume only 15mA to 20mA of current. As the power is connected, the DIODE will cause a drop of 0.7V leaving about 2.3V of voltage to power the LED. Over time, as the voltage of the batteries began to drop, the internal resistance of the LED will also increase sharply when this happen. This will reduce the current being supplied making the intensity of the LED to drop but at the same time help to prolong the lifetime of the batteries.